The last day of school is upon us. No more pencils, no more books, no more negotiating lunch and snack choices with my suddenly picky eater, begging her to eat at least half of what I pack for her. Many of my US friends and family have been out of school now for several weeks; some have already been and returned from holiday, enjoying BBQs, sunshine, and pool parties. Then there's me, counting down the hours until that final dismissal bell and thisclose from banging my head against a wall, desperately needing a break from it all. This is also the one time of year that I cannot show my daughter's teacher enough love. I can only imagine that being a teacher is a very tough job, despite the fact that many people I know honestly believe they could do it with their eyes closed, hands tied behind their backs, while juggling flaming batons. Yeah, digest that one. I'm sorry, but it takes a VERY special person to teach 25+ kids everyday, not to mention that each one comes with their own set of idiosyncrasies, personalities, and learning abilities. I don't know about you, but I truly believe it 'takes a village' when it comes to our children. If I said this once, I've said this a thousand times, but I firmly believe that teachers are grossly under appreciated and under paid. These said professors educate our children; they help mold them into the people they are destined to be. Aside from teaching basic skills, independence, confidence, and problem-solving, my daughter's teacher can get her to do things at the snap of her fingers, whereas I have to practically beg, bribe, and plead with her to do the smallest of tasks. That alone is worth her weight in gold. Let's not forget we saw, all to well, on December 14th in Newtown, Connecticut, just how far some teachers will go to protect our children while they're away from us. There is not a day that goes by I don't think about that horrific tragedy and praise God that my children are safe. To all the teachers out there, thank you. Thank you for your patience, thank you for your dedication, and thank you for being you. To all of you that love doughnuts, you're welcome. For the cookie dough, click here. I halved this recipe, however, because it's eggless, you can eat this beauty raw, so feel free to make half the batch for the doughnuts and half for your belly. Preheat oven to 375ºF. 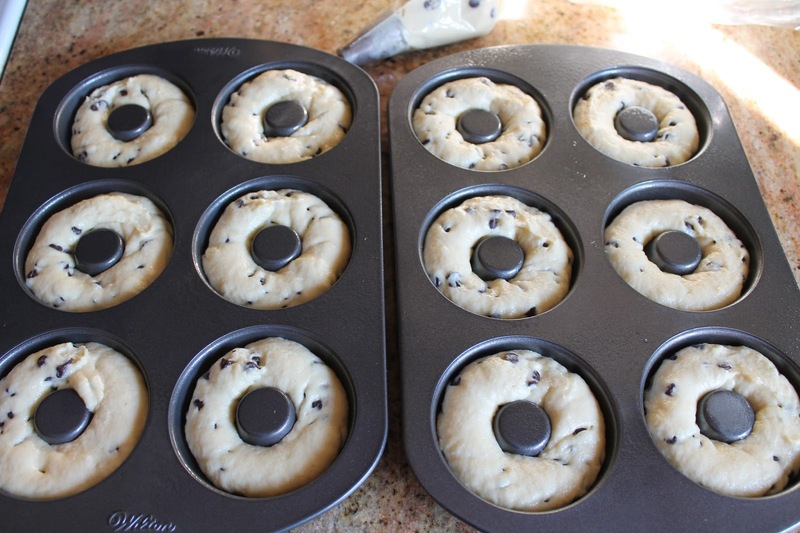 Spray doughnut pans with a non-stick cooking spray. I found this spray to be amazing when making doughnuts. 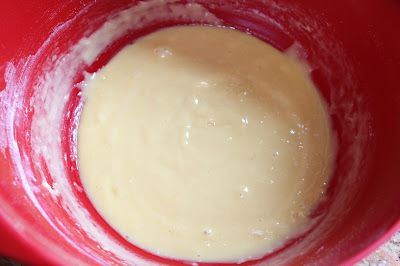 In a separate mixing bowl, whisk together egg, buttermilk, butter and vanilla until blended. Add dry ingredients to wet ingredients and mix until incorporated. Add in chocolate chips and mix until chips are coated. 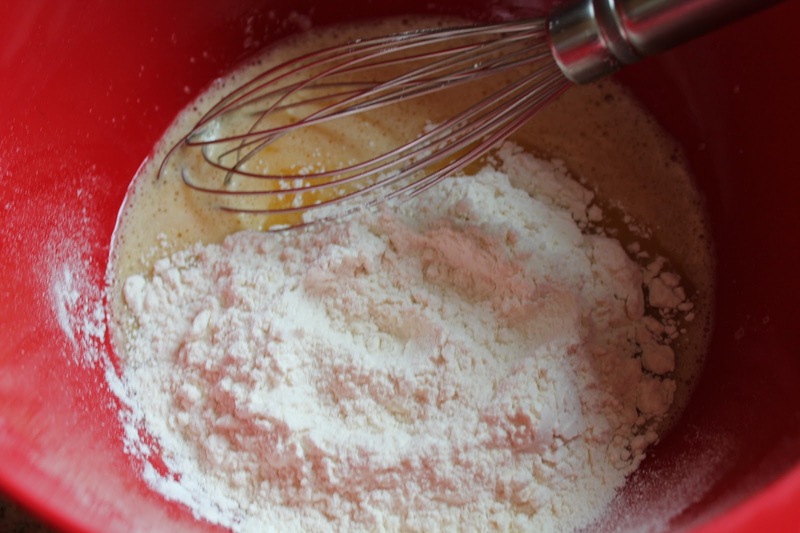 Place batter into a piping bag fitted with a large, round tip. Pipe doughnut batter into molds. Bake for 10 minutes until doughnuts are golden brown or bounces back when pressed. Remove from oven and allow trays to sit for minute or so before removing and transferring doughnuts to a wire rack to cool completely. To make chocolate glaze, click here. Dip doughnuts into chocolate glaze, covering just the tops. Allow excess to drip off. Place globs of cookie dough onto the top of chocolate glaze and enjoy! Very well said about the teachers. Though my little guy won't be in school for another 3 years or so, I have heard plenty from others and just can't imagine how teachers do their jobs day after day while yes, being underpaid. On a brighter note, I think I am grabbing my passport and hopping on a plane to your house because I need some of those doughnuts right this MINUTE. Thank you! Teachers are super important and it's a verrry hard job, this post is so sweet. I'm counting down the hours as well because then I'm on holidays for the summer! Yippee, yahoo! Having some of these donuts would be perfect to celebrate with.....wanna share?! Wow these donuts look so good! I need to get myself a donut pan! These look so yummy! I found your post on Tasty Tuesday's. Yes thank you teachers!! And let me say thank you for these doughnuts, they look amazing!!! I am drooling in front of my screen! So delicious! OMG! WOW! Did you save me one? Pinned of course! Thanks so much for sharing on Two Cup Tuesday at Pint Sized Baker. I hope to see you again on Monday night! Whoa! :) These look so good! Thank you so much for linking up with me this week at Tasty Tuesdays! I’ve pinned this & shared it with my followers! Please be sure to stop back by the party and check out some of the other links! 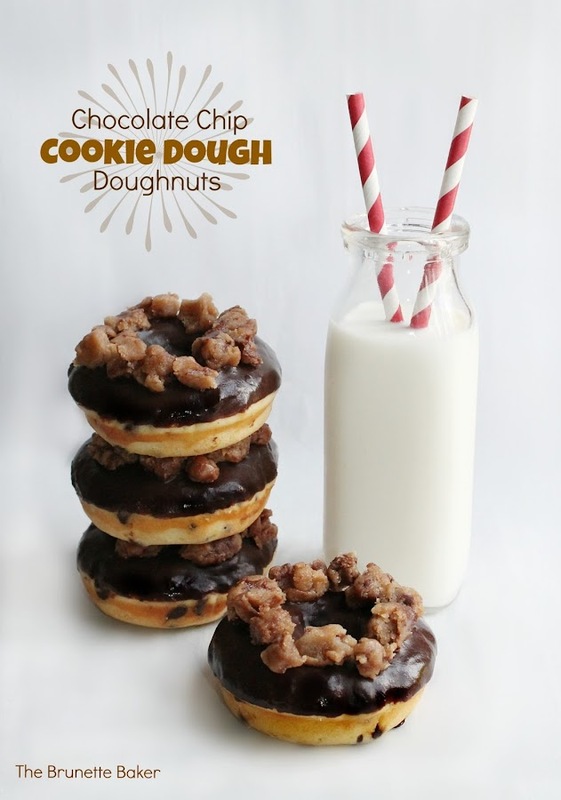 Globs of cookie dough on top of baked cookie dough donuts? I am dying inside of happiness. I LOVE THESE AND YOU. Oh Wow! My daughter would love these!